Newcastle Science Central’s first construction, The Core, is nearing completion and is due to open for business this Autumn. The building, designed by FaulknerBrowns Architects, will provide 2,750 sq. 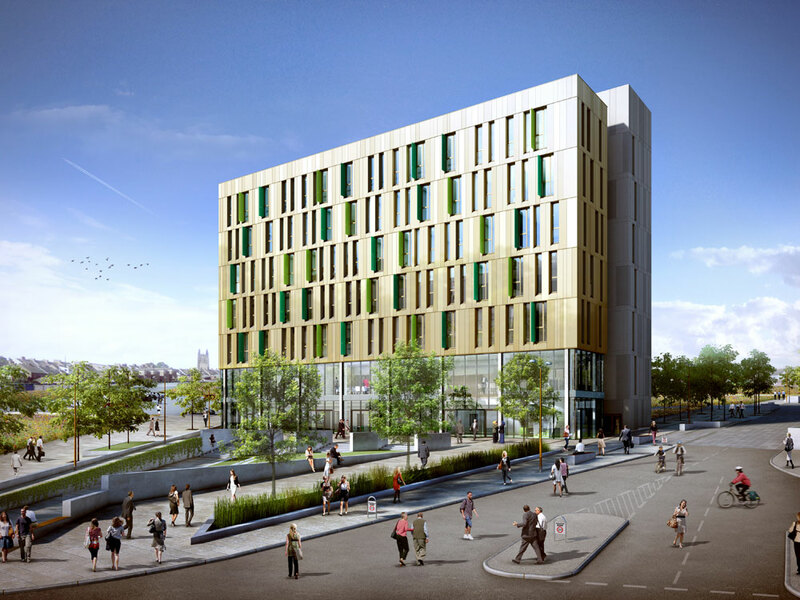 m of flexible office space for new and growing hi-tech, scientific and digital businesses, as well as a continuing professional development venue for Newcastle University. 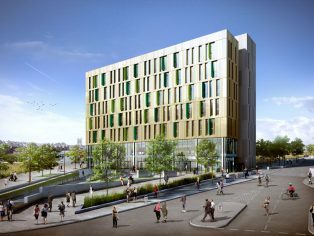 Delivered by Newcastle Science City, a partnership between Newcastle City Council and Newcastle University, The Core is part of a 24 acre Science Central site which is fast becoming a national centre of scientific development and excellence. It incorporates innovative sustainable technology into the design of the building and the public spaces around it. The building is also one of the first in the country to explore the quantity of embodied energy and carbon contained within the building materials. One of the construction’s key features is a 27m high living green wall of planting which will extend across the north façade of the building to help enhance the bio-diversity of the site with a mixture of ivies, seagrass, thyme, primulas, euphorbia and nesting boxes. Photovoltaic panels have also been incorporated on both the roof surface and within the glazed window panels, maximising the opportunities for sustainable energy as well as making the technologies highly visible. A planted sedum roof and rainwater harvesting has also been incorporated into The Core’s design. “It’s great to be the firm behind such a landmark construction. It’s fascinating to think that this was once the home of the Scottish and Newcastle breweries which supplied Newcastle Brown Ale to the world. It has now become a focus for some of the most experimental sustainable developments in the UK. To assist with the sustainable removal of excess material from Science Central, over 40,000 tonnes of coal was also extracted from the wider site during enabling works. This sustainable strategy also provided the opportunity to deal with historical mine workings which otherwise would have been filled with large quantities of concrete grouting. With its gold anodised aluminium façade fast taking shape, The Core will create a distinctive, new sustainable venue for hi-tech businesses choosing to relocate to Science Central. The building opens for business in November 2014.